WSA: Let’s get quizzical one more time! 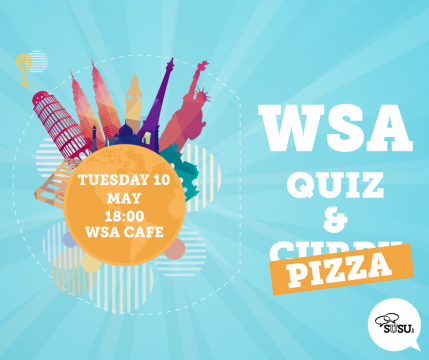 After a year of great fortnightly quizzes, it is with excitement (and regret) that this Tuesday 10 May will be the final WSA Quiz of this academic year! But, it gives us all the more reason to make it a great one! Held at the usual time of 18:00 in the WSA Cafe, this Tuesday’s quiz will be a big end-of-term celebration blow-out with pizza, chips and garlic bread on the menu, as per your request! At the bargain price of just £4.25 (food and £1 entry), you can expect question rounds from a range of topics, not to mention our classic wooden spoon round, which lets everyone be a winner! The losing team from the previous quiz gets to choose the wooden spoon round, which this time will be ‘Bloggers and Vloggers’, so if you know your Deliciously Ella from your Zoella, then this is the one for you! Find out who else is going here.